McMurdo Base on November 30th 2008 Gigapan image- panorama made up of multiple digital images stitched together. Click to pop out a window that you can zoom around. - Image Ross Swick. Robin Ardalan (1987-1988) - Grants Pass Looking for past co workers and friends.. A yearbook from this time and maybe memorabilia too. I lost my home to a fire and this was an amazing time in my life I would like to replace some memories. Kara Barnes (1988, 1989, 1990 - 91) - Sacramento, CA email I worked in the personnel office for NSFA. I was a PN3 and spent 3 summers in Antarctica. Bruce L. Beardsley, Radioman, "BB" (1980-85) - Loveland, Colorado Worked the Message Center, Savin Copier and Teletypewriter Repair, Mars shack Manager/Operator for three seasons, Winfly 82, 83, 84. Assisted in Homeport 85 prior to transferring in Dec. Met a lot of good people, Military and Civilian alike. Wouldn't have missed it for the world. 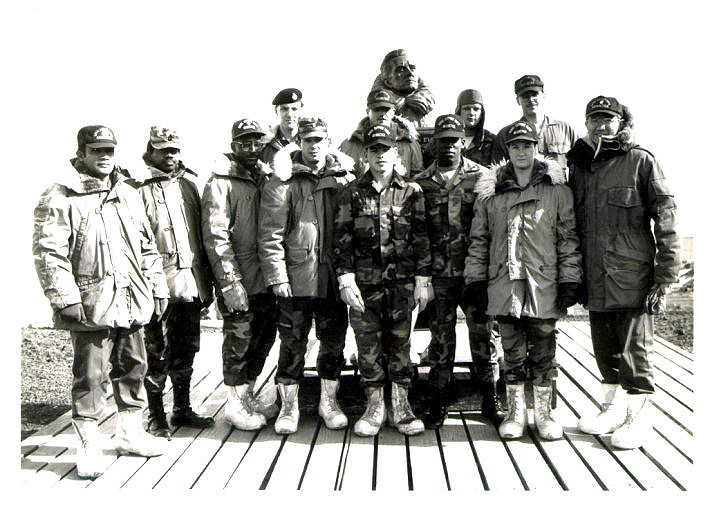 Would love to go back again..
Steve Benbrook (1981) - Mesquite, Texas USA Seabee UT2 Operation Deep Freeze Winter Over 1981. Bernie Brown (82-84) - Arlington VA Radioman, Worked the Message Center, Mars shack Operator Wouldn't have missed it for the world. Kimberly Brown (1986 -1987) - Denver, Colorado Winter Over Crew 1986-1987. I worked as a Draftsperson, Construction Coordinator, Electricians Helper, and SAR Team member. Hello to all that the adventurous souls who wintered over! I still remember the winter-over softball games, trips to Black Island, and weekend trips to the Ski Chalet. Craig Bush (EO2) (1983-1984 (w/o)) - Crestwood KY OAEA is scheduling a bi-annual reunion in Houston TX in Nov 2010. Any winter-overs from 83/84 drop me a line. Hope to see you there! Kevin Call (1979-1982) - San Diego I would enjoy contacting other OAEs that I served with there from 79 to 82. Joe Cmor (ET1(SW)) - (1984) - Darien, New York, USA Wintered-Over 1984. Retired from U.S. Navy 1994. Lives and works near Buffalo, N.Y.
Charles Chad Condrotte (McMurdo, Christchurch, Port Hueneme CA - 1979 through 1983) - Flagstaff AZ I was the Navy Dental Technician at McMurdo on four summer support deployments from 1979 through 1983. I also returned to the U.S. aboard the Coast Guard Ice Breakers Glacier and Polar Sea. Kim W Davis PO First Class (1976-1981) - Stuart, FL - Served as Field Party Shop Supervisor (HF Radio), AFAN Radio and Television Engineer, SAR Radio Technician, NNN0USV Radio Operator, Traveled the continent establishing HF Radio at Research locations, including S Pole, Palmer Station, Dome Charlie, Dry Valleys, Siple Station, RISP, and many others locations. Diane Dugger (1987 and 1988) - New Vernon, NJ, USA Would like to find my friends Ann Davis, Anna (sorry can't remember her last name) and Lisa Fedderoff. I hope they find this and will contact me! Larry Estes "Sweet Pea" (McMurdo 1980-81) - North Richland Hills, Texas Wintered over during the 80-81 season. One of the best thing God allowed me to do and see. Took a ton of slides, wish I could get them all digitized. Clark Ferguson (Winter Over 1981 McMurdo WD Plant) - BT2 W/O 1981 at the Water Distillation Plant (WD Plant) and worked with the outside plumbing crew. Eric Foresman (NSFA McMurdo, WO -87 88) - Iowa USA I was the winter over fire chief with a great crew, Kenny, OBO, Tom, Scott, Eschete. A great adventure for my last year on active duty. Rita Garland (1988-1989) - Christchurch New Zealand Worked as barber at McMurdo and Williams Field . Peter Gasparik (83-86) - Staten Island Spent 4 awesome summer's as a Radioman, worked our butts off and partied just as hard, miss it all from hut 10, the Erebus club to det Christchurch.. Good times and memories. John Gasperetti (1974-1974, 1982-1984) - Renton, Washington email I was stationed with the Seabees during the 1974-75 and 1982-1984 summer seasons. I ran the bake shop in the evening and would like to get in contact with all others that were there during that time frame. Great times, great people and of course great parties! My daughter actually went there a few years back working for Raytheon, had a great experience. Brian Graham or Guntha (Willy Field and McMurdo RNZAF - 1981) - Pukekohe New Zealand, Worked with the aircraft loading team in 72 flew with VXE6 as exchange load master in 81. Many other visits with the RNZAF. Grampa (McMurdo 1984 Winter Over Team) - Sun City Center FL Lots of great memories in an unique place that only a handful of folks have had the pleasure to experience both summer and winter in remote location on earth. Paul Green (Terminal Operations US Army 1985-86) - Temecula I volunteered for Operation Deep Freeze II from 1985 - 1986. I worked in Terminal Operations. I also worked as one of the TV Broadcasters as well as worked on the cruise book committee. I still have my old cruise book. It was one of my favorite memories. I'm also friends with one of my fellow army buddies who also volunteered. Looking for others that served during this time. William Bill T Gunn Jr (NSF Antarctica Year/s 86-87) - Tennessee USA Coming up on 30 years since I wintered over, would do it again in a heartbeat! ET1, 200 Degree Club, first married couple to w/o, met SecNav, signed the OPS Hill log book, went skydiving in New Zealand, slept on the ice at Williams field, bartender, rock and roll radio broadcaster, and all around good guy. Pictures, stories, etc. for trade. Bill Hames ATC, USN (McMurdo, Willy Field, South Pole, Su Support 1976-79, WO 1986-87) - Oklahoma City Best duty of my Navy time. Great experience and some awesome people. Happy to be an OAE!! Tim Henley (McMurdo Station winter over 84 / 85) - Norfolk Va - Send me back!!! Andy Holesha (1986, 2005) - Biloxi, Mississippi, USA. Ed Holton (1987 - 1991) - Douglas, AZ, USA. NSFA Medical. email I was Leading Petty Officer of NSFA Medical from 1987 through 1991 and made 4 deployments. My last time was spent as the Senior Medical Dept. rep in Christchurch. 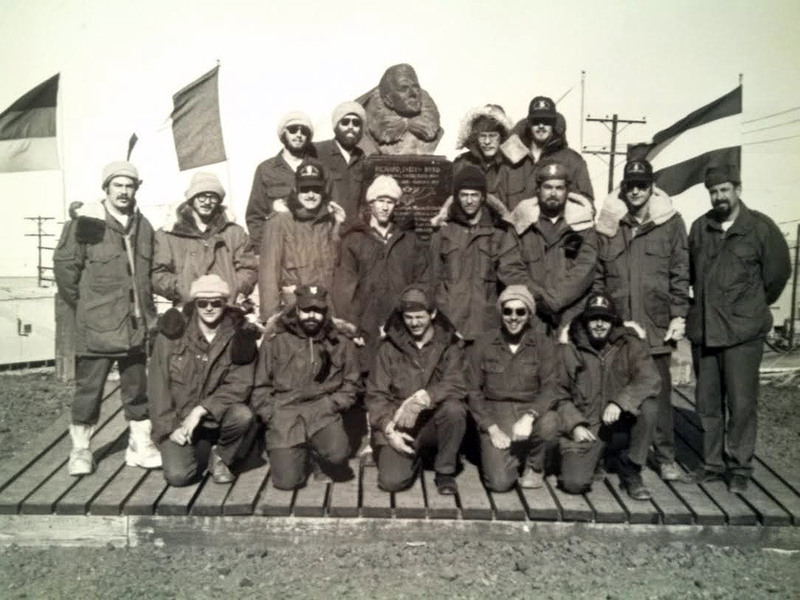 I would like to hear from any shipmates that were there at that time, as well as any current personnel of McMurdo medical. I was the last Navy X-Ray Tech permanently assigned to NSFA Summer Support. Scott Hudson aka Napier Waggon (1987-1989) - Baghdad, Iraq 1987-1989 at McMurdo was a magical time with some of the best people I have ever known in my travels. RM Charlie Johnson (Winter Over 80-81) - Mt Clemens Michigan The best Radioman gang in the World... Thanks Don and Chief. Mike Johnson (82/83 - WO) - Milwaukee, WI USN-Retired MR1(SW) 1983 W/O crew. Arrived 10/5/1982, departed 10/5/1983. Worked for the Seebee's Transportation Dept. as the assigned machinist. Would love to hear from anyone who was stationed at McMurdo during this time. Greg Laubert PR2 (1984 - 86) - Mays Landing NJ Came to the ice 84-95 season, the rest spent in Chch. I loved it all! Thomas Learned (McMurdo - 86-99) - Houston TX Ironworker on 206, 207, Crary. Antenna Rigger, Construction Coordinator. It was all good. Kenneth Leckie (McMurdo, Christchurch, 81 - 83) - Fort Smith, AR I was a Builder with summer support. I Loved it, would like to go back in a heartbeat. Tim Leistico (South Pole '80 / McMurdo '82 / Williams Fld Year/s 80-85) - Oakland CA Nice to find this site. Jesus Lozano (W/O 87/88) - San Antonio, TX USA 33rd W/O. Had a great time with everyone down there, would like to know if anyone has pictures of me flying my kite, at midway point , between McMurdo and Williams Field, during Fuel transfer? Andrew McDiarmid (McMurdo 1986, 1987, 1988, 1989, 1990) - Houston, Texas Worked as the Morale Welfare and Recreation Petty Officer 1986-1991. Todd McDonald (McMurdo Station - 1981, Winter 1982) - Orange Park Florida - Aerographer (Weather) for Summer, then was last minute Winter Over 1982. Put together a WO82 Yearbook. Wonder who still has one. Nick Merrick (McMurdo - 1983 to 1992 WO X 3) - Christchurch USARP Garage 83-84 W/O, Welding shop 85, Iron-worker 86-87, Power/Water Plant 88-92 two W/O A piece of my heart is still on the Ice. Michael T Morris (McMurdo, 1986-1989) - Richmond, Texas, Some of the best years of my life, enjoyed all the staff and had great W/O companions. I wintered over 86-87 and again in 89-90. Would I do it again? You betcha!! Mike Mullen (NFSA McMurdo USCGC Glacier, 1980-84) - Grand Prairie, Texas Best tour of duty during 23 years of Naval Service. Many memories and long lasting friends due to this assignment. It was great being a Navy Photographer assigned to NFSA. It was almost like being on a 4 year vacation. R. McCurdy RMCS USN Ret. (McMurdo Sta Communications Crew - W/O 81) - Chambersburg, Pa. Loved the ice and great people. Rodney "TJ" Petrin Jr (1981 - 1986) - Sunapee, NH - Served Summer Support from 1981-1986. One season Winter Fly in, one season as Homeport Representative and a half season as liaison in Christchurch, NZ. Kurt Pitz (McMurdo, Willy Field, South Pole Stations - 1987-90) - New Providence PA - Summer Support for two years, home port rep my last year. Spent first season in Mactown as FM Radio Comm Tech, second season spent time at Willy and South Pole as Radar Technician, also was at Byrd Surface camp for repairs. Love to touch base with any other folks from my time. Karen Roberts Francis (1981-82) - Georgetown TX I was a Hospital Corpsman at McMurdo Clinic from Sep 81-Feb 82. Retired from USNR as HMC and from my "civvie" job in Sep 2015. McMurdo was the best adventure ever and I'd go back in a heartbeat. Would love to chat with anyone from that time period. Jim Russell (Kiwi Jim) (1980-1981) - Burleigh Heads Worked on the radio station, and Operation Deep Sink. Mark Shaffer (McMurdo, South Pole - 87, 88, 90, 91) - Cragsmoor NY Worked as insulator and pipefitter on 207, 208, Bio-Lab, Heavy Shop. Assisted "Psycho" Mark Albershadt at South Pole Jan-Feb 1991. Went to Survival school 2x. Should've w/o. Elizabeth Slizz Linsey (McMurdo 85 to 94 and Palmer w/o 92) - Aberdeen North Carolina Loved my time on the ice. Love to hear from ice friends. Shona Smith nee Hastie (McMurdo - 89 to 94) - Brisbane, Australia I worked/lived in MacTown a number of Summer/Winfly seasons as well as a Winter-over. Thomas L. R. Smith (McMurdo Station & Port Hueme - 1987-1989) - Olympia, WA US Army Captain assigned to NSFA Terminal Operations. Made two deployments to the Ice. Retired from the Army 1998 as a Major. Dale Stansbury (McMurdo - 19881989) - Bremerton Wa Looking for members of the W.I.P.P crew that summer. Barry, Pablo, Leroy, Danny, etc. Also would like a picture of the plaque inside the chapel with the "God Squad " on it if it still exists. Gene Starks (w/o 1987,1988,1990 and 1991) - Sacramento Ca. Miss the Ice a lot tried to return several times but due to heart disease that's not possible, remember building the dorms 207and206, dismantling several T-5s, jamesways, working on installing the rolling overhead doors in the heavyshop, may other construction projects, trips to Black Island, and the dry valleys. John Cummings, C.J. Ringlieb, Nate Sheldon and myself were the first to work back to back winters, now I see its common. First winter was the hardest but also the most memorable. Oh yeah hello to Al Martin, and Kim Brown. Jim Terrace (1983) - Madison Ohio - w/o 83 worked in the boiler room wise choice it was cold that year like to hear from some of the group best times ever. Peter Vossenberg (McMurdo and Amundsen Scott South Pole Station - 1982) - Orlando Florida - Winter over at McMurdo and in 1986 Winter over at Amundsen-Scott South Pole Station. I was the cook baker during both winter overs. Mark Webster (Operation Deep Freeze - McMurdo 79 to 80, Winter Over 80) - Lees Summit MO Looking to locate over Winter Overs from my group from McMurdo. Trying to get together Reunion. Ralph Wilson (1982-1983) - Seattle WA I was a Navy Corpsman at McMurdo for the 82-83 Summer Support and I also worked at Williams Field. Please email if you would like to chat. Trying to find - To use this option, fill in the registration form at the bottom of the page, but include your own name and email as a contact, requests kept online approx. 2 years.